Strawberry shortcake “cupcake.” Photo by Zac Williams | Pink Princess Cupcakes. 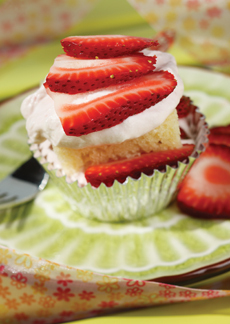 Take advantage of beautiful, red strawberries in season to make these easy yet elegant individual strawberry shortcakes served in festive cupcake wrappers. Think of them as “strawberry shortcake cupcakes.” The idea comes from Barbara Beery’s Pink Princess Cupcakes book, which has many other wonderful ideas. May 21st is National Strawberries And Cream Day—perfect for this strawberries-and-whipped-cream delight. But most people would say that any day is perfect for them. Take a look at a classic strawberry shortcake recipe, that uses a biscuit instead of cake. CHILL a large mixing bowl and beaters in the freezer. MAKE the whipped cream: beat the cream, sugar and vanilla on high until stiff peaks form. Refrigerate until ready to assemble. CUT the pound cake into slices 1/2" thick; then cut into squares that will fit into the cupcake liners. Save the scraps for a trifle. ARRANGE 24 silver cupcake liners on two cookie sheets. PLACE a piece of cake, whipped cream and strawberries into each liner. Repeat the layers. Serve immediately. PLACE a layer of cake scraps in a glass bowl. Sprinkle with orange liqueur. Layer with whipped cream, then sliced strawberries. Continue to layer until ingredients are exhausted. TO SERVE: Bring the bowl to the table and pass with a serving spoon. Optional: Serve with a small snifter or liqueur glass of the orange liqueur. Cupcake photo © Copyright Barbara Beery; Gibbs Smith, publisher. Other content Lifestyle Direct, Inc. All rights reserved. Images are the copyright of their individual owners.